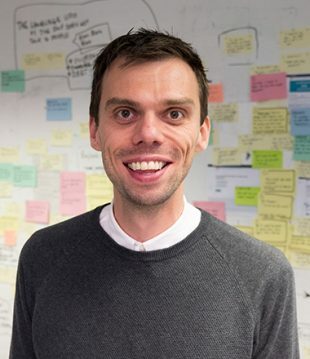 Hi, I’m Ryan Hewitt – I’m a Lead Business Analyst (BA) based in DWP's Stockport Transformation Hub. We did a lot of work in 2016 to build the BA community in DWP. To continue that, we recently held a DWP Business Analyst community get-together in Stockport. More than 30 BAs attended the event. Following feedback from previous sessions, we wanted to introduce new techniques that would be useful for BAs in a hands-on and fun way, to reinforce best practices and further strengthen the DWP BA community. On the day we ran six sessions including interactive exercises. We started with a team-building exercise, the marshmallow challenge. The goal of each team was to create the tallest tower using the supplied materials and place a marshmallow at the top. The winning team’s structure was an impressive height of about 50cm. 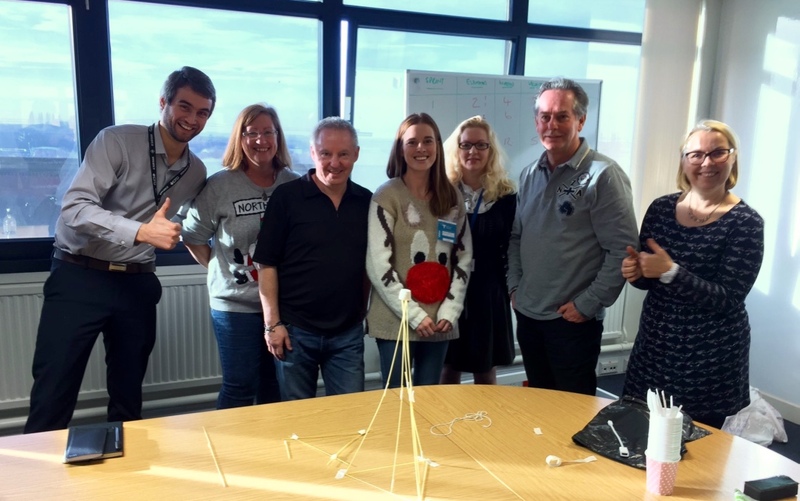 It was good fun but it had a serious purpose – it showed the importance of iterating, working together and working under pressure. The next exercise looked at applying user stories, based on the book ‘User Stories Applied’ by Mike Cohn. Each group was given a pack of 10 ‘user story smells’. These are bad practices that have been observed when creating user stories. For example, writing user stories from the perspective of a product owner rather than end user. The ‘smells’ were printed off as cards. We asked each team to write down their observations about each card and then match them to 10 example user stories. This was really well received - it reinforced the learning and got people to think about their own experiences. Several BAs had asked to learn about impact mapping – a technique that makes sure deliverables are traced back to the overarching goal. We discussed the core elements and looked at an example impact map. The teams then tackled an impact map exercise: to create an impact map to get Stockport County to the top of the Premier League by 2025. Having a non-work example was useful and the activity kept people engaged and helped them learn about the technique. To help BAs understand the importance of organizational strategy and the potential impact on projects, next we did an activity which got people on their feet. The presenter asked a strategy question, and BAs had to move to one of four corners of the room which represented a potential answer to the question (answer A, B, C or D). The format was a good method of generating interaction and discussion. It helped us baseline the level of knowledge people had for strategy and made a potentially tough subject engaging and fun. Use case diagrams can often be overlooked in agile projects, so we had a session looking at the essential elements of use case diagrams. We discussed their benefits for agile projects – namely that they provide an overview of how the actors interact with the system. We also talked about a number of examples of how use case diagrams have been used in the DWP on agile projects. We closed the day with a pub quiz-style session featuring 25 questions. We asked questions about the INVEST criteria, 3Cs, jobs-to-be done format, user story mapping, as well as some fun questions about Stockport. It was a good fun way to reinforce the knowledge and some of the techniques from previous sessions. Community days are a brilliant opportunity to reflect on best practices and share experiences with colleagues. They allow members of a community to learn new techniques and practice them in an informal environment. It’s an opportunity to step back from the day-to-day project work and reflect on our experiences and professional development. If you’d like more details or content from the sessions we’re happy to share them. Just email us and we’ll send the resources we used to run the day – including presentations, activities and handouts.